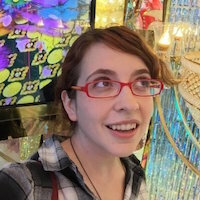 Laura E. Hall, Founder, Timberview Productions & Meridian Adventure Co.
Laura E. Hall is an artist, writer, puzzle-maker, immersive environment and narrative designer living in Portland, Oregon. Her work focuses on the intersections between arts, culture, and technology, especially in gaming. She is a co-founder of Portland's first escape the room game company, the award-winning 60 Minutes to Escape, and the author of Katamari Damacy for Boss Fight Books. Her immersive design, puzzle game, and escape the room company Meridian Adventure Co. opened in 2018. She proudly serves on the board of the Portland Indie Game Squad (PIGSquad), a non-profit organization supporting game development and indie game enthusiasts in Portland, and on the board of the Enthusiasm Collective, a not-for-profit creative co-working space for artists and activists in Portland.